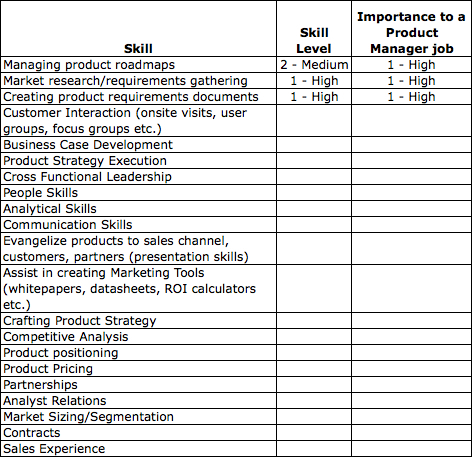 This is the first of three posts I intend to make related to my talk on “Managing your Product Management Career” at ProductCamp Boston. We as software product managers, spend a lot of time managing products at work. We assess the competitive position of our products, we identify gaps in the product’s feature set and then enhancing our products to fill these gaps. This kind of assessment is an ongoing effort to make sure the products maintain their competitive edge in the marketplace. But how much time do we spend in our working career to assess the competitive position of the ONLY product we have absolute control over – OUR OWN CAREER? We could switch jobs, we could get laid off, we may switch careers, but amongst all this, there is only product that is constantly with us – our own skill set. If we do not assess where we stand and work on maintaining our competitive edge in the marketplace, we can only expect to become outdated and not finding a buyer for our services (future employers). So how do we do a skill assessment to understand our strengths and weaknesses? It is quite simple and can be done using a simple Excel spreadsheet. Here is what you do. 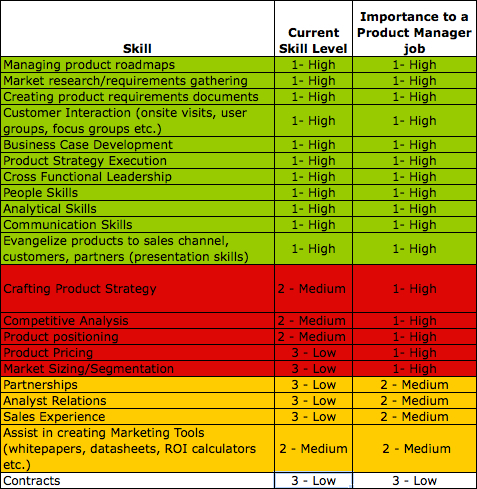 2) Then make a honest self assessment of where you stand today and how important this skill is to a Software Product Manager job on a scale of 1-High, 2-Medium and 3-Low as shown below. 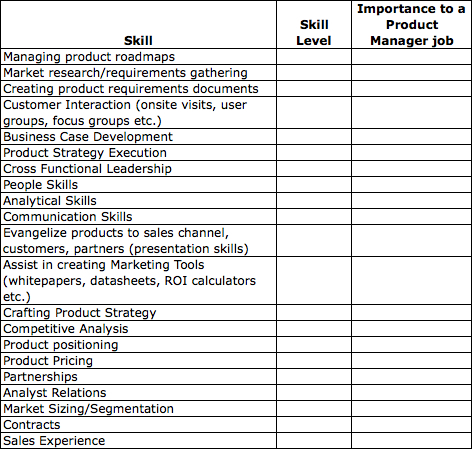 3) Once you have completed the assessment, sort the spreadsheet so that the rows where “Importance to a Software Product Manager job” is 1-High and your current skill level is also 1-High is at the top as shown below. 4) The picture should now become clear. 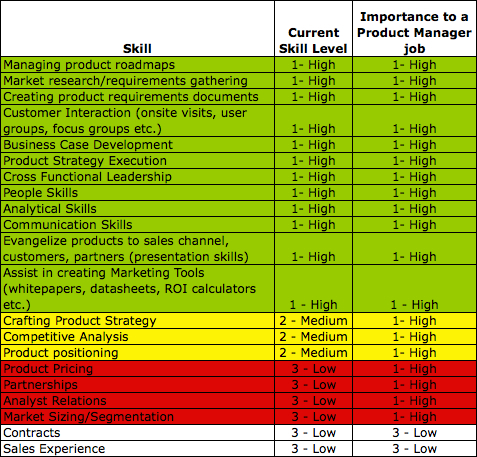 The rows colored in green are your strengths and the rows in red are your competitive weaknesses. This is where you should devote your energy, time and money. You should plan on revisting this spreadsheet every 6 months to add new skills that you have developed and also to update your current skill set. 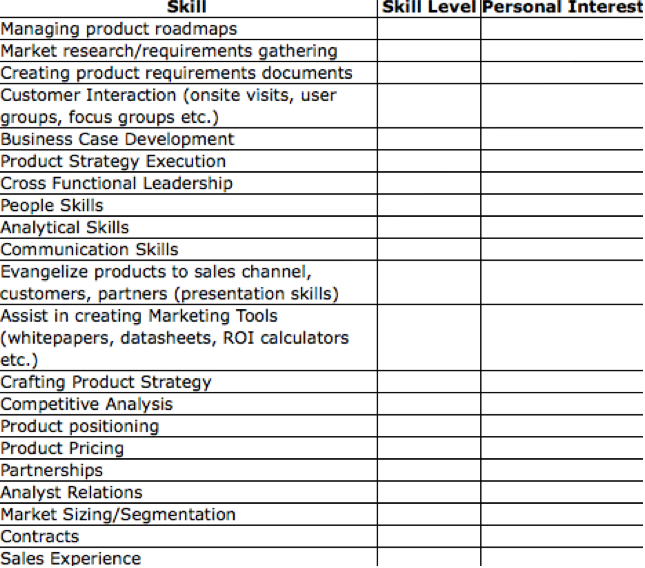 I agree that it is important for a product manager to continually assess their skill set. This is especially true in a difficult economy when product management positions are often the first to be eliminated and the last to return. Domain Experience: Many companies put more value on domain experience than product management skills, which is unfortunate for both the company and the product manager seeking new opportunities. The “must have” domain requirement can be insurmountable in a difficult job market. So in a good job market it might be worthwhile for a product manager to consider opportunities in a new domain regardless of how much they like their current position. Company Recognition: Often when a product manager works for a well known and successful company that carries a (sometimes undeserved) presumption of product management expertise. Unfortunately, the inverse is somewhat true. Working for a small and/or unknown company without conspicuous success can make it more difficult for a product manager to present their product management expertise. A product manager should give careful thought about how long to stay with a distressed company, given that this is unlikely to enhance marketability. I think it’s a good exercice to perform once in a while to reassess our skills and career progression. Gopal you make some good points about accessing your own product. While I have been taking greater stock of my “product” of late, I haven’t done anything formal about it. The spreadsheet idea is an area to start and at least get it out of my head. I agree with John’s comments about Domain Experience and to a lesser degree Corporate Recognition. However, I believe that if you are accessing yourself as a product you should be able to counter both of John’s concerns. This is a matter of identifying the market you want to work in and addressing that market’s needs. It is not an easy process and may require some extra work on the side. Barriers to entry are only barriers to the uninitiated. If you use content from other blogs or books, it is a minimum professional courtesy to include your source. The grid is right out of the product management handbook. You are not only violating copyrights but also misleading your readers. I personally take it very seriously when someone accuses me of violating copyrights and misleading my readers. I have been a true professional and have been blogging for the last few years. Given that I have been doing product management for 14 years, it is quite possible that there are ideas that I have used that may also have been mentioned in some book. In this particular case, I was asked to do this specifically by a VC at Commonwealth ventures in 2007 when I was looking to switch jobs after spending 11 years at SolidWorks. Could some handbook have had a similar idea, of course it is quite possible. Did I copy it from a book, absolutely not because I am not even aware of what handbook you are talking about because I don’t have one and have not read it either. I don’t know who you are given that I just have your name as Steve and your email id is stevep, but if I were you, I would have reached to the blogger to get a clarification before you throw an unfounded accusation at someone. That is what I consider as professional courtesy. Cheers! Very useful and also inspiring to improve our skills. Also can you please consider posting some articles on how to improve these skills. I am not bothered about if you have copied it from some book or not but I liked the way the things are put-up here. We can assess our own strength in many fields but sometimes people see us differently from what we are. Maybe we can consider also the opinion of others.